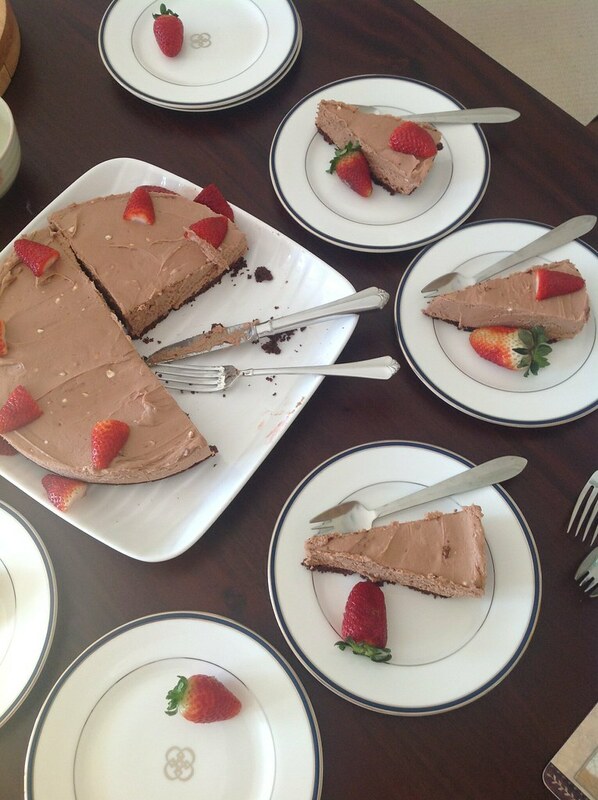 Some recent experimentation – toblerone chocolate & cheesecake. Smooth with nutty textural pieces of nougat and a mousse-like texture, this one has got it goin’ on! Plus you don’t have to mess around with eggs or gelatin which makes it incredibly easy to put together. Grease and line a 25cm springform cake tin and set aside. Melt and cool the butter for the biscuit base. Set aside. Process the chocolate biscuits in your food processor until they are finely crushed. If you do not have a food processor, use the ziplock bag and rolling pin method (will not achieve as fine a crumb as you would in a food processor). Add the butter to food processor and give it another buzz to combine (or if using ziplock bag, just add to bag and mix with a spoon to combine). Pour buttery crumb mixture into lined cake tin and press down with your fingers to cover base entirely. To give it extra firm and a flat top, you can use the bottom of a drinking glass to press down on the crumbs. Pop in the fridge to set for at least half an hour before starting your filling. Break up Toblerone into pieces and melt in a double boiler, stirring occasionally with a metal spoon until smooth. Set aside to cool for at least 10 minutes. Beat your cream cheese in the stand mixer or with a hand mixer / large bowl for about 2-3 minutes until it’s nice and creamy. Add caster sugar and beat for a further 2 minutes, followed by the Toblerone and beating for another minute or until combined. Finally pour in cream and beat for a final 2 minutes until everything is smooth and combined. Pour the Toblerone cheesecake mixture into the chilled crumb base and smooth down with a spoon or a small offset spatula. Return to the fridge for at least 2 hours (I found that it had a beautiful consistency after chilling in the fridge for after 2-3 hours). Serve with a few halved strawberries and enjoy! “Eat Drink Man Woman” – makes me want to head out for yum cha everytime I see it. I have always loved the movie “Like Water for Chocolate”. Beautiful looking cheesecake! I have such a soft spot for Toblerone. My husband and I would always buy a really large pack of it from the duty free store when we travelled. So Toblerone always makes me think about holidays! I must admit I’ve only read the book for “Like Water for Chocolate” and definitely need to see the movie! Yes I also buy Toblerone on holidays too heheheh. Love duty free 🙂 Thanks for dropping by Stephanie! Chocolate and cheese always seem to go pretty well together, especially in cheesecake form! Thanks for dropping by Jess! Willy Wonks and the Chocolate Factory. My favourite childhood movie! To this day, I still wish such factory exists! Me too Kevin, me too!! Thanks for entering! Willy Wonka and the chocolate factory. What kid doesn’t dream of that much chocolate! Definitely a classic that never gets old. Thanks for entering Tabatha! Me too, the book is also wonderful too. Mmm, chocolate.. Thanks for entering Louise! Chocolat – a movie about my favourite subject! Funny, it’s mine too! Thanks for entering Katrina! Julie and Julia, Meryl as Julia Childs was a classic! I completely agree, she did a fantastic job in that role! I absolutely love that scene where she’s eating fish in butter in the beginning scene of the movie and she utters “mmmm.. butter”. A feeling I can definitely empathise with hehe. Thanks for entering Melinda! The French movie Chocolat, so delicious and a wonderful cast! I think so too! Thanks so much for entering Nicola! Babette’s Feast – A feast for the eyes and the stomach! Eat, Pray, Love – has inspired me to visit Italy! Eat Pray Love – the ultimate indulgent film! And love the wonderful giveaway, thanks for the opportunity! can u please giveaway a toblerone cheesecake 😀 it looks yum! Toblerone anything works for me. Cheesecake? Yes, please. This looks wonderful — thanks. ‘Julie & Julia’. Talk about a performance with joie de vivre. Merryl brought Julia Child to life with the kind of gusto never seen before. Does a food TV series count? Cause I love me some Iron Chef! Chocolate! I’d could go some Johnny Depp! Harold & Kumar Go to White Castle. Yeah munchies can be epic. Being a chocoholic with no chance of ever giving up, Chocolat rates number one with me. Chocolat – two of my favourite things, chocolate and Johnny Depp… I could eat both. I love Chocolat… as long as I have chocolate with me. Chocolat. A movie about grace, acceptance, chocolate and a yummy Johnny Depp. 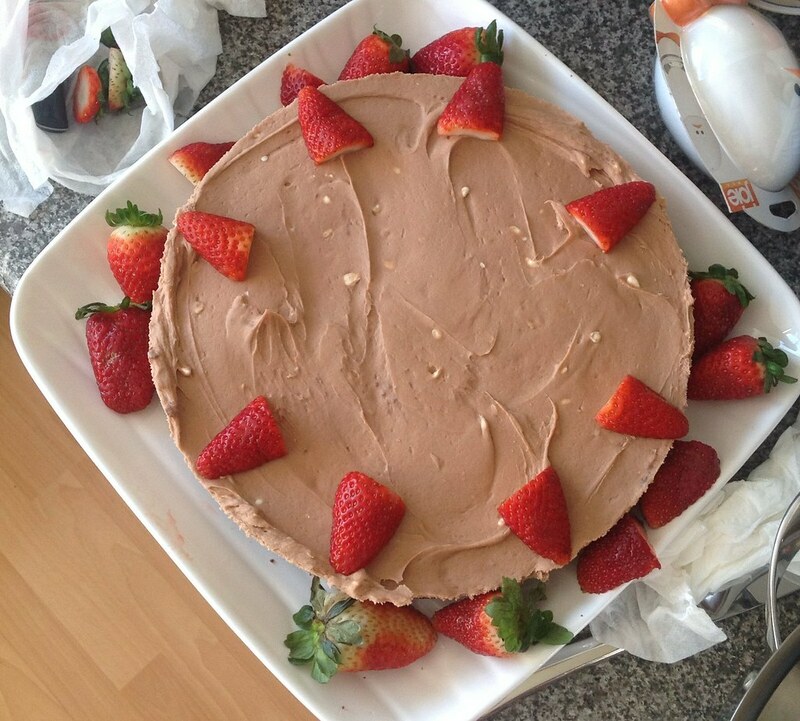 Hahaha that must have been a fate to make this delicious looking Toblerone cheesecake! Wow, it look delicious! I love Toblerone and this is a new cool idea for cheesecake! That cheesecake looks amazing and toblerone is one of my favourite chocolates!